NASA's MESSENGER spacecraft has detected big pockets of ice and water in the north polar region of the planet Mercury. The image shows a perspective view of Mercury’s north polar region with the radar-bright regions shown in yellow where water and ice has been detected. Mercury is the closest planet to the Sun. It orbits the Sun from a distance of 46,000,000 to 70,000,000 kilometers (29,000,000 to 43,000,000 miles) and takes 88 days to complete one. Without an atmosphere to retain heat, the surface of the planet fluctuates. Mercury can reach to temperatures up to 700 Kelvin (K) which is hot enough to melt lead but there are areas that have temperatures as low as 50 K. 0 K is absolute zero. Despite this, there are areas in the planet that are shielded from the Sun's heat. These are located in the polar regions of the planet. 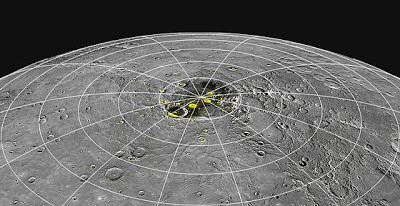 It is in these areas that NASA's MESSENGER (MErcury Surface, Space ENvironment, GEochemistry and Ranging) spacecraft have discovered "evidence of big pockets of ice... from a latitude of 85 degrees north up to the pole, with smaller deposits scattered as far away as 65 degrees north..."
MESSENGER's Neutron Spectrometer detected elemental hydrogen in the area which is a large component of water ice. This and the combination of data observations (composition, spectral, and geometric) and thermal models provided strong evidence for the presence of ice. Also, the temperature profile reveals that dark, volatile materials, consistent with climes in which organics survive, are mixing in with the ice. The video below explains in more detail how the ice is detected. The presence of organics (which is a prime source for the beginnings of life such as carbon) does not necessarily mean that there is life in Mercury but it does raise questions on how these materials interact with the ice and water present. These organics are believed to have been introduced to Mercury through comets, such as how scientists think also happened to the Earth. Since the 1990's, scientists have suspected the presence of water and ice on the planet. But without instrumental measurements of the planet then, there was no way to prove the theory correct. These pockets of ice were discovered in craters that are permanently shadowed from the sun's rays. Messenger is scheduled to do further measurements and observations to gather more information on this exciting discovery.